On April 13-14, 2018 the NWA MQG hosted the All Modern Quilts Show. Our goal was to have a quilt show with all modern style quilts. For our first show we wanted to keep it simple and learn for the future. Everything came together nicely with so many people helping out as needed. The show was a success as a fundraiser for our guild's future programs and the feedback was nothing but complimentary. We are planning the next show for April 17-18, 2020. Save the date. Guild Challenges (over the past 5 years), items displayed together. Viewers Choice voting, pick 3. 1st, 2nd, 3rd place awards were given. Our new t-shirts are fantastic! A venue with a lower rate. Less financial risk and stress of success. Venue with plenty of tables and chairs to use as needed. Another local guild had quilt racks and flags/yard signs to rent. Professional hanging with no upfront investments. Facebook Event and having members share the link often. Printed postcard flyers distributed to area shops and guilds. Electronic quilt registration with Google forms. Great for organization, sharing, and making quilt labels. Only NWA MQG members could exhibit. Nice representation of our guild and increased new memberships. No time limit on when the quilt was finished. Being our first show with 6 months notice to members this was essential to have enough quilts. Quilts larger than 40" x 40" had to have a hanging sleeve. Experience. 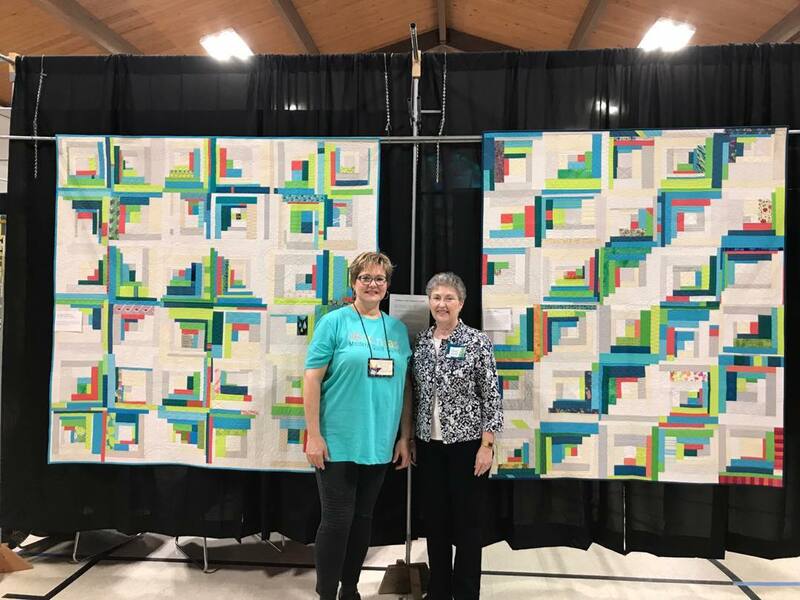 A hard working team of guild members and husbands with decades of experience in setting up, working, running, and taking down quilt shows with another local guild. Mapping out the space before hand and placing painters tape marks on the floor. Pre sorting out the smaller items we displayed them in a larger side room. Labeling the back of each quilt with it's size, name, maker, and number. Periodically tallying the viewers choice ballets. The end counting is faster this way. Members received free admission. We had 52 of our 61 members present and availible at all times even if not volunteering at a work station. Matching t-shirts in teal color made members easy to identify. Also we wore our handmade name tags. 2 hour volunteer work shifts, all seated jobs with chairs available. Attendees were given a plastic food service glove to use to touch or see quilt backs. Each quilt had a unique number on its front label and listed in the program. Each quilt had a label printed from the registration form information. It included Quilt Number, Name, Maker, Quilter, size, description, modern characteristics, and challenge name if applicable. Pre sold quilt raffle tickets at area guilds and events. Raffle license. Check with your state early and ensure you meet their requirements. Weather. Heavy downpours Friday afternoon. View when you first entered the gym. A view down another row. A view in the small quilts room. We charged $5 for adults and kids under 18 were free. Attendees received this 2" complimentary sticker. Raffle Quilt tickets were $1 or 6 for $5. Our quilt was reversible. Reverse side. Catnip fabric donated by Gingiber. Working on hanging the raffle quilt. Sorting the labels in the small quilts room. The setup crew on lunch break. We were excited to meet some visitors from the Tulsa MQG! In February 2018 our member Jeanie Schneider lost her battle with cancer. We arranged some of Jeanie's quilts for a memorial display. Therese and Hazel were founding members and leaders of our guild from 2013 - 2017. The blocks for these quilts were made in 2017 by members of NWA MQG as a gift to Therese Ramsey in appreciation for her 4+ year tenure as Guild President. Therese, in turn, graciously shared some of the blocks with Hazel McFall for serving as her Treasurer for the same tenure. A small committee of members organized the block design and made baggies of fabric and instructions. These were explained and distributed at our meeting, the month Therese was not present due to knee surgery. Members could add one piece of their own print fabric to the block. The whole project was done in secret from Therese. The blocks were collected over 5 months in secret at meeting check-ins. Months later we presented them to Therese and she was truly surprised!! 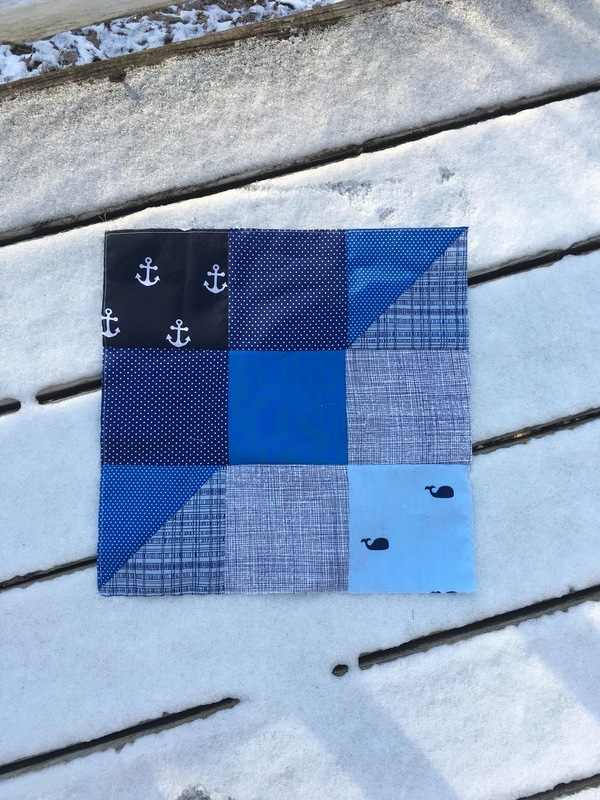 Note: Members were asked to make the improve log cabin block and use all extra fabric from the baggie to make any block design of their choice. Elizabeth Ray later arranged all these extra blocks into our raffle quilt top, Sonja Koch made a backing and did the quilting, with Dorothy Day finishing it with binding. Our challenges are to help members grow and think as a quilter and meant for sharing and FUN FUN FUN! The NWA MQG has frequent challenges. A quilt challenge is a theme or an idea that each member can then design a quilt or pillow around. At the monthly meeting when a challenge is due we have a big show and tell for the challenge items. It is always inspiring to create, try new things, and share these projects as a group. Many are displayed here at the show and will be indicated at the bottom of each quilt label. Here is a poster that summarized all our challenges since inception. We had this challenge in parallel to the national MQG Flying Geese Challenge so members could enter it in QuiltCon if they wanted. 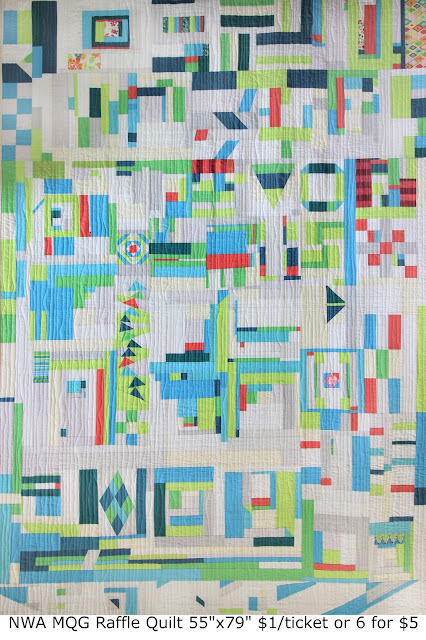 Participants for this challenge were asked to modernize a traditional flying geese block (any variation is acceptable), and make it into a modern quilt using modern quilting elements. Cotton and Steel was a new modern fabric brand. The Cotton and Steel challenge came about when Therese and Hazel went to QuiltCon and were able to glean scraps from the C&S booth. Scraps were divided into small baggies, and we were to make what we could using the contents of the bag. The 2017 Pantone color of the year was Greenery. The NWA MQG piggybacked on a challenge some national bloggers (bryanhousequilts) hosted. The project was to contain Greenery or similar green. Other colors or neutrals were fine as long as Greenery was the feature color of the quilt. Not a challenge but we hosted a Carl Hentsch lecture and workshop in October 2017. We had 20 members in the Fox Hole Pillow workshop from his book New York Beauties & Flying Geese. Many learned foundation paper piecing in the workshop. Carl was a great teacher with beautiful quilts we highly recommend inviting him to your guild. Sample quilt label. Each quilt had a label including Quilt Number, Name, Maker, Quilter, size, description, modern characteristics, and challenge name if applicable. Quilts made by the 3 winners of the lime, orange, grey wonky start block lotto in 2016. Debbie, Hazel, and Leeanna. Marty, Hazel and Elizabeth with their SuperNova quilts from a local Jacquie Gering workshop. First place, #55, Gravity by Natalie McCrory quilting by Sonja Koch. Second place #4 Another Time Another Place by Natalie McCrory quilting by Sonja Koch. Third Place #109 Smile by Kathy Garringer. Vendor tables and Guild store. Our 2 vendors were Owl and Drum and Gingiber. Both are friends of the guild and presented programs for us in 2017. Also they sell online so visit their stores wherever you are. Tearing down. Many workers and handy husbands! Great news we are raffling a modern quilt! Tickets are $1 or 6 for $5. Members can pick up packs of tickets for selling at the meeting Tuesday Feb. 20th. Also we will be selling at Gateway Mortgage 214 W Walnut, Rogers on March 8th, 4:30-7:30 and at our All Modern Quilts Show April 13-14. The drawing will be April 14th. Hopefully this message find you well. I have suffered a few bouts of illness in January which was no fun. I have been busy filling out or programs for 2018 and excited to share that with you. We have a lot going on this year with our first quilt show, programs, swap, and workshops. The growth of our group and new opportunities is exciting. I look forward to everyones participation and enthusiasm it's going to be a great 2018! Don't forget we have moved to the Southside Church of Christ, 919 S. Dixieland Rd. Rogers, AR 72758. It is the front building on the Northwest side. Door open at 6 and meeting still start at 6:30 pm. A huge thank you to Natalie McCrory our new "Jedi Key Master", for picking up and returning the key each month. Our 2108 membership dues are $35 payable asap. If you can't attend Feb or March meeting and would like to send in your dues. Mail a check payable to MQG of NWA to us. For the address please email nwamqg at gmail.com and we will send that to you. Mark your calendars for April 12th which is set up day and the show is April 13-14, 2018. Volunteer when you can we need everyone to pitch in, Sonja will have more details on volunteer specifics. Leeanna got us a great free advertising opportunity for our show. Our guild will participate in the March Arts on the Bricks in downtown Rogers. If you aren’t familiar with the event, here are a few details. We will display quilts in the windows of Gateway Mortgage, 214 W. Walnut, across from Arvest Bank. One of those quilts will be our raffle quilt. We will need 6 or 8 other quilts depending on their sizes. We will hang them on Feb 14. If you are interested in donating a quilt for this display please let Leeanna or Elizabeth know before Feb 14. The Arts on the Bricks event will be March 8, 4:30-6:30pm. This is a great chance to have our art seen, and see the work of others displayed in downtown businesses. Also, you can experience some of the excellent restaurants downtown. We will have more info at our Feb meeting. Our MQG friends over in Tulsa reached about a swap. I have been working with their VP on the details. We will be having a modern mugrug swap Size: 4”X8” to 8”X12”. Sign up sheet will start at Feb. meeting. It will have details on colors, styles, ect. Partners will be asigned one to one so you make and receive from the same person. Sign up deadline in May meeting. Mugrugs need finished for the Aug meeting. 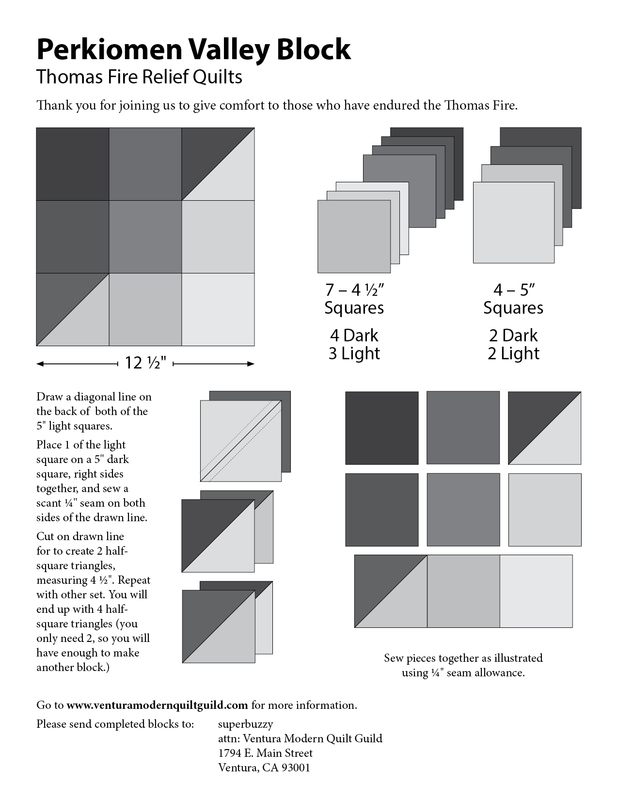 I am really excited to make these connections with other MQG guilds. Make a quilted item that was inspired by a piece of art. This is not a pictorial quilt but rather the art piece inspired you with it's shapes, style, subject, or colors. Bring a picture of the art that inspirer you and tell how it inspired your challenge quilt. Any kind of art from 2D: painting, drawing, digital, even ads or marketing materials to 3D: sculpture or architecture. I always get great ideas when ever I visit Crystal Bridges. This challenge was suggested by one of our members. Our challenges are to help you grow and think as a quilter and meant for sharing and FUN FUN FUN! So have fun! Destash sale bring your items priced and be ready to buy new stuff!! This fundraiser was a hit last year with many requests to do it annually. Go through your sewing supplies and destash anything you no longer need or will use. All items are donated and the money from sales go to our guild. Items that don't sell we will store and sell again at our Quilt Show. Bring all items clearly priced. Here's some general guidelines but it's by no means comprehensive. Any fabrics are excepted, no need to be modern. If you think it will sell and you are done using it, bring it! Fabric yardage $3-$8 per yardFat Quarters $1-$3 eachcharmpack 5" $5-$8layercake 10" $15-25jelly roll $15-$25scraps** $0.5-$1 per oz **place your scraps in a clear plastic baggie Books/Magazines 25-50% of retailnotions/other stuff 25-75% of retailother stuff 20-60% of retailPartial projects and handmade items are welcome too! As you saw in November our new space has a nice kitchen and we can have food and drinks. We need a person or 2 to be snack coordinators. Help with setup and cleanup and make a schedule. Natalie McCrory has volunteered to be a co-snack manager but we need one more person to work with her. Think about it! Ge involved. Natalie will have a snack sign up sheet at the meeting. I am still looking for a person to be Program Coordinator or VP of Programs if that sounds better to you! If you are interested in this job let me know. Bonus- you will always like the speakers if you get to pick them out! We started our baby charity program last year and call it Quilt.Share.Love. QSL was organized by April Wells who has resigned. We need a new Charity programs person. Think about it and let me know if interested. Sadly April has resigned as treasurer. We thank her for all her service to our guild. Sheena Johnson has volunteered and will be our new treasurer. Sheena has a bookkeeping background and we are happy to have her. Thanks Sheena. Our Raffle quilt is made. Sonja quilted it and Dorothy Day did the binding. We are still waiting on license it should be soon. Once that goes through we need everyone to sell tickets. We will let you know. Bring check or cash for membership dues and to shop the sale. We are so excited for our first quilt show. It will be an exhibit of our members' modern quilts. A viewers' choice award will be given for first, second, and third. Go fill out this form https://goo.gl/forms/aexBIdH6o6Osdup33 for each quilt you want to enter. 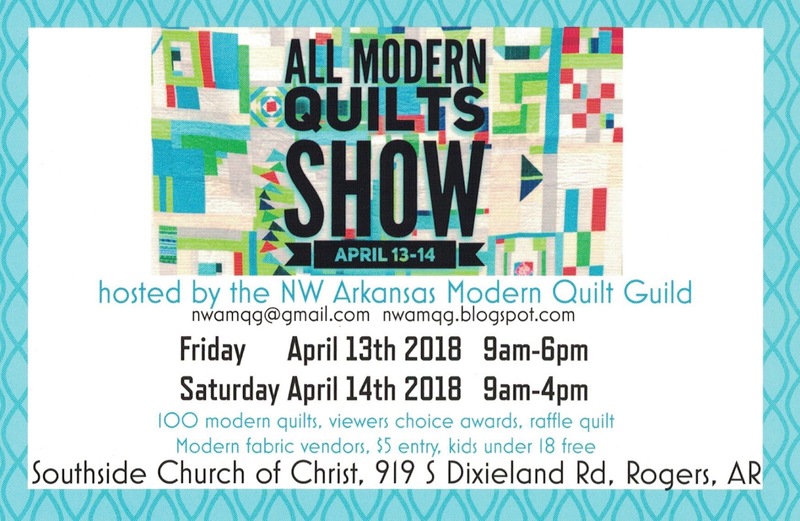 NWA MQG 2018 Members only can enter quilts in the show. The quilt must be made by a member and be a modern quilt. There is no restriction on when the quilt was made or finished. Quilts will be juried by photograph simply to ensue they are of modern design using the definition, by The Modern Quilt guild which states: characteristics of modern quilts include, but are not limited to- the use of bold colors and prints, high contrast and graphic areas of solid color, improvisational piecing, minimalism, expansive negative space, alternate grid work, "Modern traditionalism" or the updating of classic quilt designs is also often seen in modern quilting. You will receive an email before March 20th letting you know which quilts were juried into the show or not. Your quilt will need a hanging sleeve for it to be hung in the show. Small quilts don't need a sleeve and will be hung with safety pins. Also ensure your name and the quilt name is on the quilt for identification purposes. Drop off at the March 20th MQG meeting, SouthSide Church, Rogers to Sonja or Elizabeth. Otherwise arrange a time to drop at their homes. Phone or text first. What to do? Make Charity blocks. California has been enveloped in flames and many people have lost their home's as well as their belongings. There's nothing like the warmth and comfort of a quilt when you're feeling down. So what would be better to do with our time on this freezing day than to pull out some fabric, put on a good movie and sew your heart out! The Ventura Quilt Guild has come up with a block pattern and they will piece the blocks together. All we need to do is make the blocks and mail them in. I will collect your blocks at the February Destash Sale. While you are pulling out that fabric don't forget about our Destash Sale, bring your unwanted sewing supplies, books, fabric, etc.... Remember One Quilters' Trash is another Quilters' Treasure. For more information on the Ventura Block check out their website. This quilt was pieced by the Northwest Arkansas Modern Quilt Guild. If you want to see it in person, it will be hanging at QuiltCon 2018 in the Charity Quilt Challenge Area. 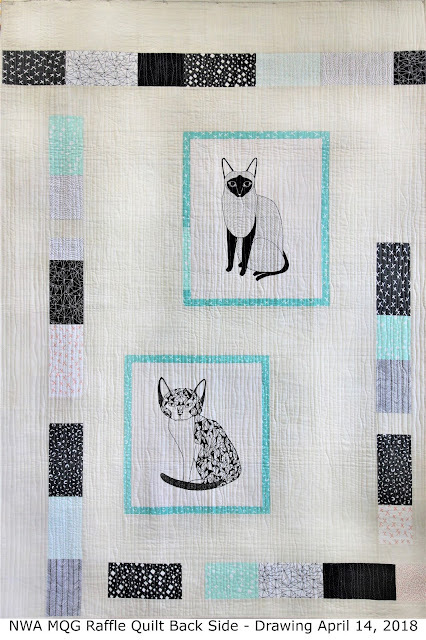 I am a big fan of basting and yes on the quilt frame. Still use your clamps. Just a quick tip. This quilt had an 8 point intersection of bulk in every corner. So I had to work around those points instead of through them. In the open space, I quilted all kinds of fun stuff. The Color Hourglasses were quilted with the same Triangle and on the Cream Hourglasses, the lines where a bit different all through out. I love editing photos here are a few that I changed up a bit. Finally the sun came out and I was able to get a few better pictures. This quilt would not have been made if not for our President, Elizabeth Ray. She is always motivating our guild members to try new challenges. Now it is off to the Binder/Sleever, Dorothy Day. to everyone that helped make this quilt. I am so lucky to be a part of such amazing quilters. We would love for you to come join us. The first meeting is free. Check the Join Us! page for more details.